Last Spring my Mom, Sister and I had the honor or throwing a very special someone a bridal shower. This special someone's name is Meagan, and we have been the best of friends since Kindergarten. You see, Meg and I had always dreamed about our weddings as little girls. And we always knew we would be in each others weddings. And as fate would have it, we got married within a year of each other. That meant a lot of wedding fun between the two of us! Meg is the type of person who loves a good party that includes a fun atmosphere, lots of colorful decor amongst good family and friends! Growing up, we had countless celebrations together, but I wanted to make sure this one was extra special. 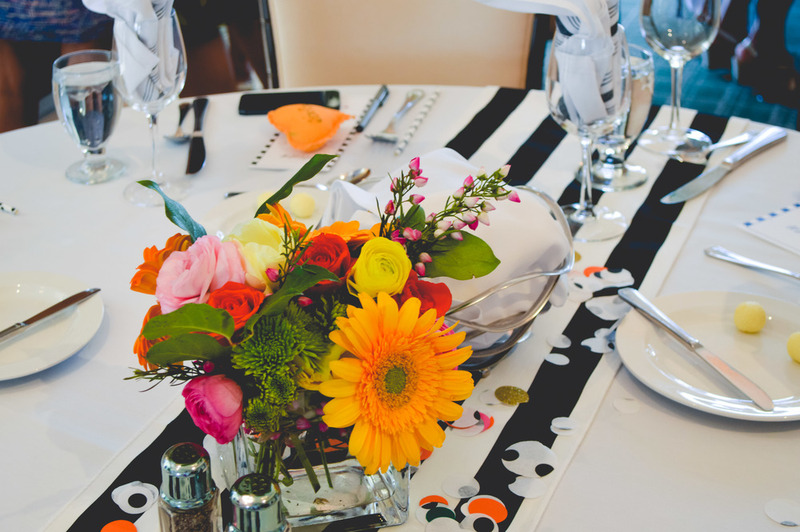 Our theme was black and white with pops of pink, green, and orange. We carried the theme out from the beginning with the invitations through the end with the favors. 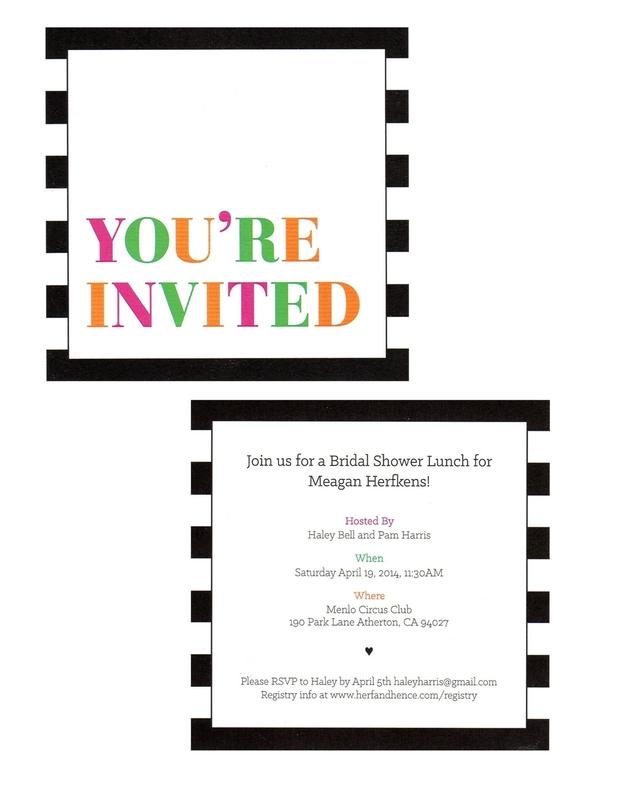 Planning this shower made me go out of my go-to "neutral" color scheme and have some fun with color! On the menu: Salad sampler with cobb, fruit and Chinese chicken salad, and ice cream sundaes for dessert. 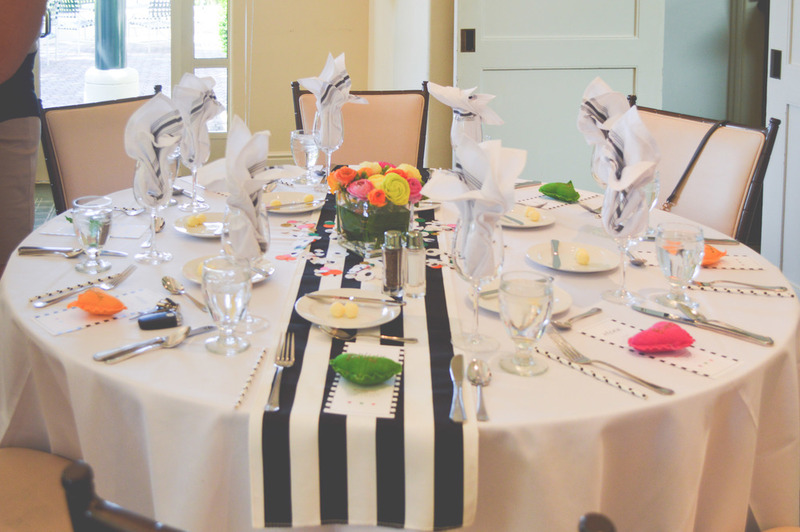 The tabletops were lined with black and white striped runners, topped with mixed flower arrangements we put together, and colorful confetti we made out of tissue paper. Since the tabletops were so busy, we stuck with plain white dishes topped with these adorable menus that matched the invitations. My Mom made the name "cards" which were hand sewn pouches with their names painted in gold on them. 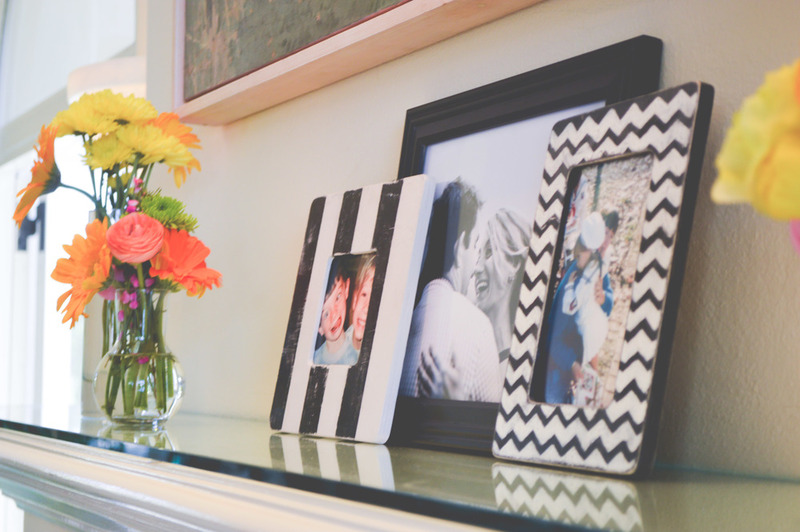 To add a personal touch, we placed black and white picture frames throughout the room that included baby pictures, friends and family and engagement pictures. 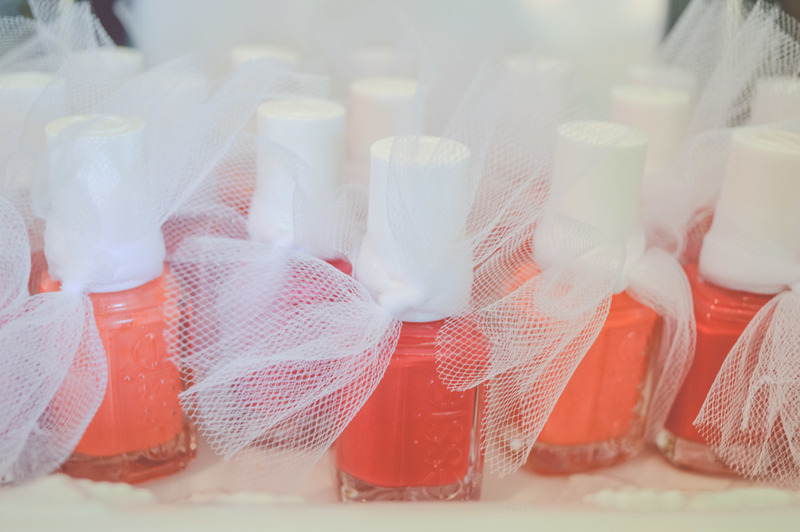 Instead of traditional party favors, all of the ladies got to "choose" their favorite shade of pink and orange Essie nail polish to take home. Per the request of the bride, we opted out of playing any bridal shower games and focused on enjoying good company, food and showering Meg with lots of love and gifts! The best part of the day was celebrating a friend whom I've seen through every milestone in life amongst her most coveted female friends and family. I wish Meg and Kyle nothing but the best in their future together!